Whether you want to buy new locks for your home or want to make your business safe, selecting the best lock can be very difficult. There is a lot of variety available in the market. Each has its own advantage. You need to gain certain knowledge before selecting which lock best suits your need. The following lines will help in you in choosing the best locks depending upon your requirement and preference. These are one of the most common and recognizable locks, found all around the globe. They are easily accessible, portable and come in a variety of sizes. They are the single type of lock that doesn’t need to be permanently attached to anything to function properly. It has two types: combination and keyed padlocks. You need a certain combination of padlocks to open the lock in case of combination padlocks. For keyed padlocks, they require a specific key to open it. These locks are often used on the gates of the houses and are of three types: single, double and lockable thumb turn. In single deadbolts a cylinder is outside the lock and the thumb turn makes up the inside of the lock. The major fault in it is that it can be easily unlocked provided a small opening close to the lock. The double deadbolts use a second cylinder on the inside of the lock, replacing the thumb turn. They are more secure but can prove to be quite a nuisance. The third type is a fusion of the first two types. They are a bit expensive but are secure and easy to use. They are commonly used in houses and offices on interior doors. They should not be used as a primary and reliable source of security, owing to the fact that lock is inside the knob and can easily be broken off the door. They are almost similar to knob locks and are mostly used on interior door in business and commercial places. They have a bigger lever-like knob which makes it easier to open. The handles can prove to be quite fragile. Therefore, keep that in mind before buying. These are simple locks with many applications. They are used for cabinets, mailboxes and for low security purposes. They come in different lengths and can rotate clockwise and anti-clockwise between 90 and 180 degrees. Rim/Mortise Locks Rim is adjusted on the inside of the door and mortise on the outside. They are commonly used on glass, apartment and commercial doors. They are used in different devices and are of two types: single and double with a thumb turn. Wall mounted Locks As the name implies, they are mounted on the wall. They are used for emergency exits, alarm boxes, and Knox-Box. 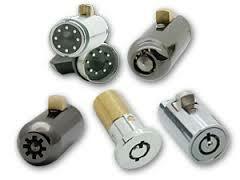 Furniture Locks They is used for cabinets, desks and sliding doors. They come in two different types: bolt style and push buttons style. They are used in large institutions and are controlled by two types of keys: normal and control key.